The first week of Fall, y’all! I love fall. Crunchy leaves. The orange, yellow, red, and brown colors everywhere. Pumpkin spice lattes (yes, I know there’s no pumpkin in them – don’t ruin it for me). Apple cider. Jeans. Sweaters. Scarves. Things were just as seasonal in the Patience Fruit Stand this week. We wrapped up our science learning about apples after completing an apple investigation that integrated art, poetry, writing, math, and science. Ask your firstie whether apples sink or float, and if they can name all the parts of an apple. We capped that learning by making home-made applesauce in the crock pot. Firsties took turns cranking the apple peeler and watched in amazement as the apples spiraled out into perfect apple slivers. 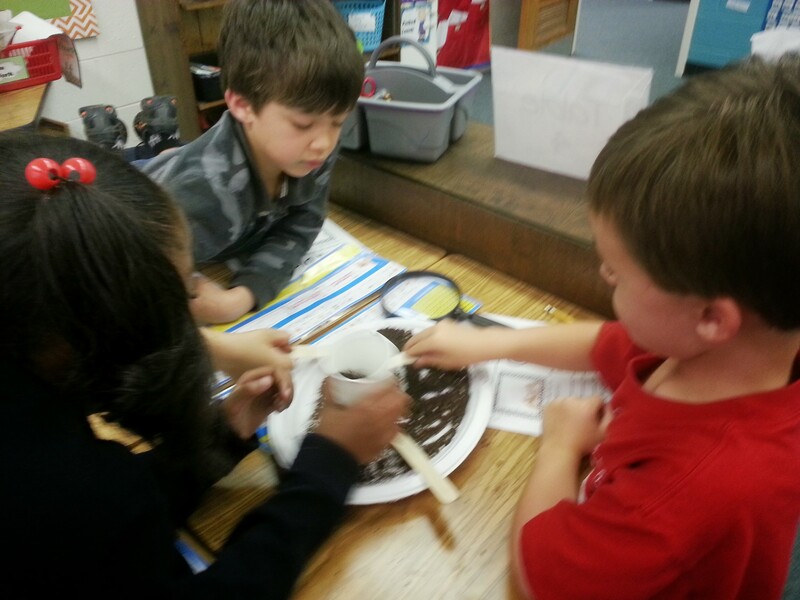 They got to measure out and add the water, sugar, and cinnamon, and mash it all up. Our room smelled like Fall all day! The funniest firstie comment: “Why is it brown? Why isn’t it yellow like real applesauce?” Gotta love it! 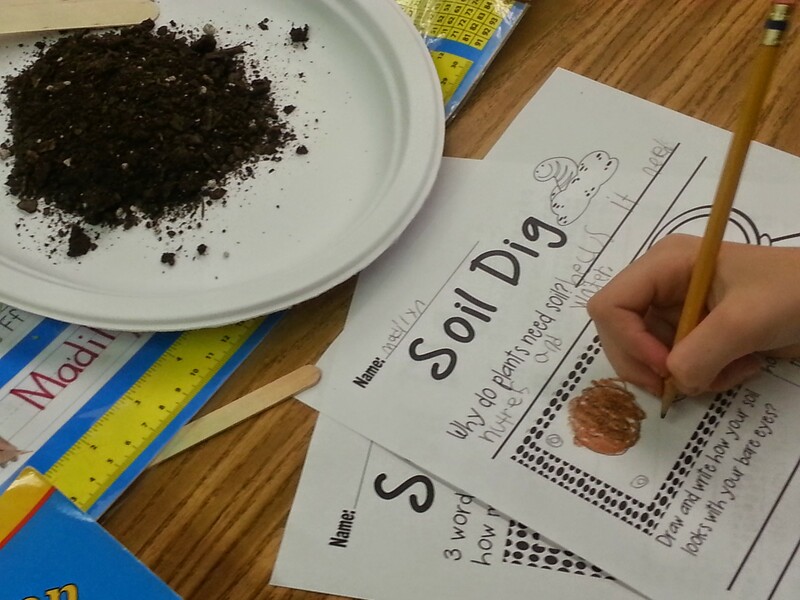 At the end of the week we finished thinking about apples and moved into pumpkins. The firsties were very surprised to learn that pumpkins are a fruit! They also couldn’t believe that pumpkins are not always orange, and learned that they can be white, red, striped, or even blue! 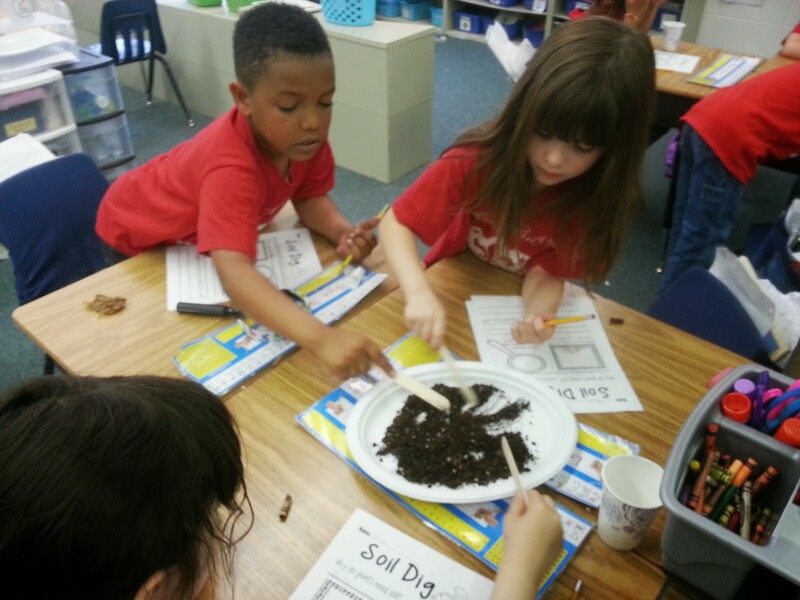 They learned about the life cycle of both plants, and did “thinking like scientists,” using their five senses to make observations and collect data. 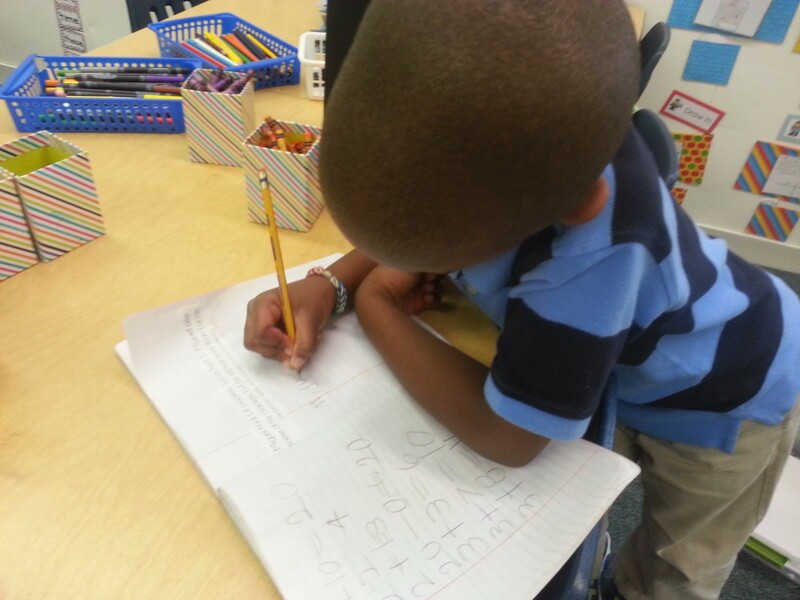 In reader’s workshop we learned how to do Word Work. 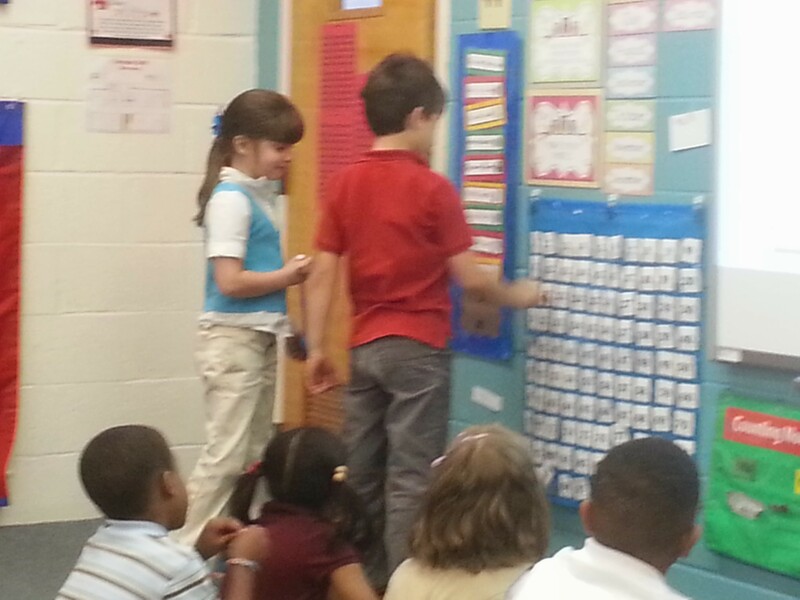 Students are given a “must-do” task that reviews recently learned phonics skills to complete in their word work notebook. 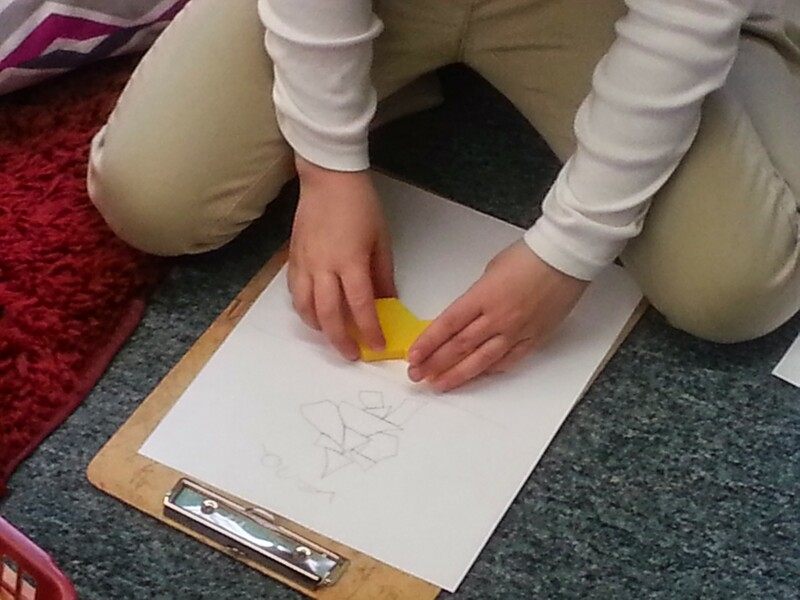 Once that task is finished, they may choose a “can-do” activity, building words with wikki sticks, play-dough, magnetic letters, letter stamps, or dry-erase boards/markers to further practice word-solving and spelling patterns. 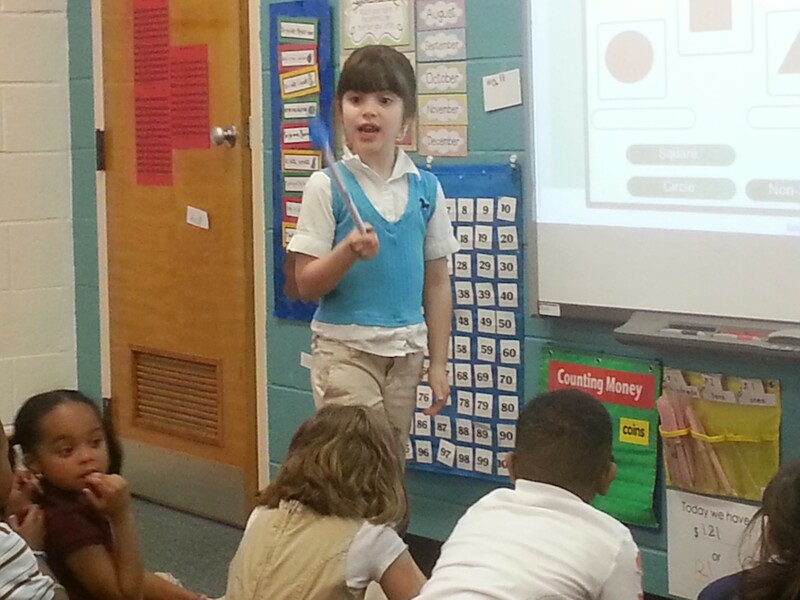 As writers, the firsties began learning about the writing process. This week, they learned how to write a first draft of a story and began learning how to revise and edit their own work. This is many firsties’ favorite time of day. Some have already written several first drafts of stories, and will begin editing and revising them in order to move onto second drafts. I am loving the stories I am seeing so far! In math workshop, students have been working on composing and decomposing numbers, graphing, building numeracy skills by identifying a myriad of ways to represent a number, place value, and reviewing rote-counting by 2s, 5s, and 10s. They are noticing and using patterns in the 100s chart to strengthen their understanding of how to build and use numbers. 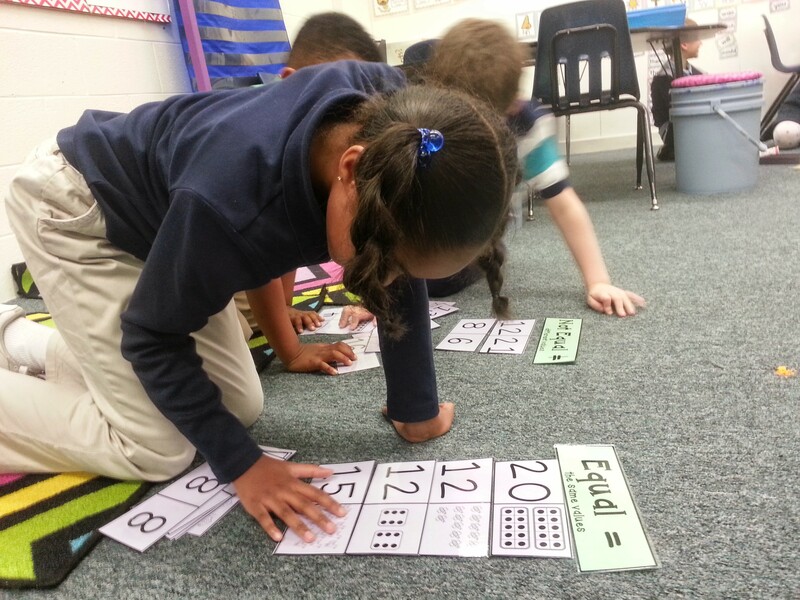 One firstie noticed that numbers in the “2 column always has a 2 at the end!” They should be able to explain how to use a hundreds chart and what happens to the numbers as you move up, down, left, or right. 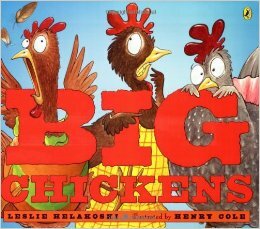 Our favorite book this week was probably Big Chickens, by Leslie Helakoski. Ask your firstie what made it so hilarious! We also loved Pete the Cat and His Four Groovy Buttons, The Snatchabook, From Seed to Pumpkin, and The Seasons of Arnold’s Apple Tree, among others. Ask your firstie to tell you their favorite parts. In Bible we learned all about Joseph, who, as one firstie described him, was a “dreamer.” We learned about how he did the right thing by forgiving his brothers, who sold him into slavery in their own jealousy. The firsties even designed their own multi-colored “fabric” using markers and water mist on coffee filters to create “coats” for Joseph. We made our own textured paint in art to paint our own pumpkins. 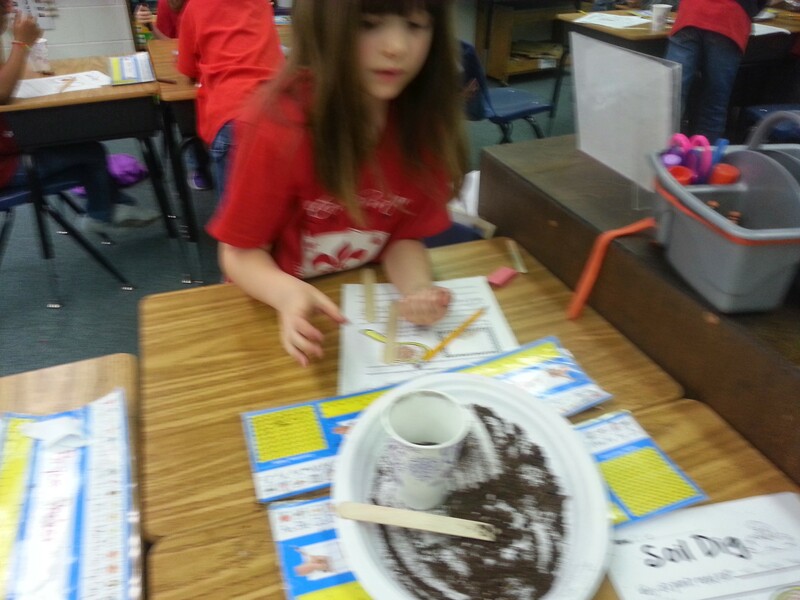 We added flour and salt because the firsties thought that pumpkins are often rough and bumpy. 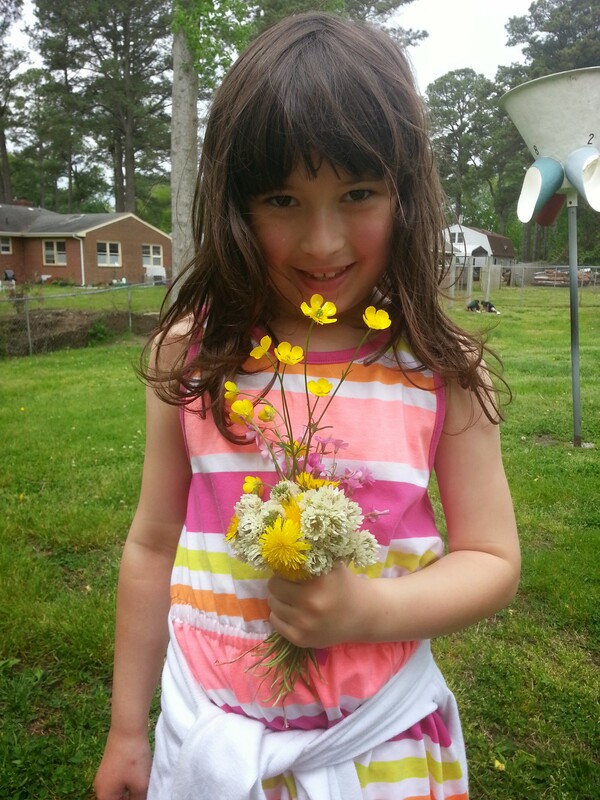 They decorated the pumpkins they designed themselves with stems, vines, and tendrils. 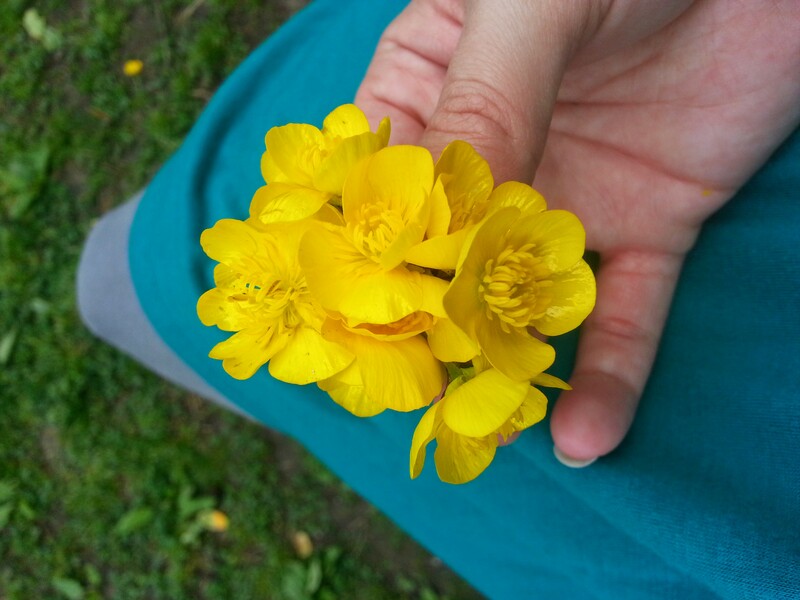 All in all, it’s been a fabulous week. It’s been very, very busy, but we’re fully in the swing. I love each and every one of these firsties already! Whaaaaat!? How is it possibly already MAY? Didn’t we just start this school year a few days ago? I feel like I was just putting up bulletin board boarders and labeling book boxes with my sweet firsties’ precious names! Well, after a week of Spring Break and two weeks of achievement testing, we’re finally back into the swing of our regular routines and schedule. Homework will start back up again and we’ll start learning about a new Author of the Month! Information about this quarter’s project went home this past week and I can’t wait to see everyone’s creative ideas for serving others. 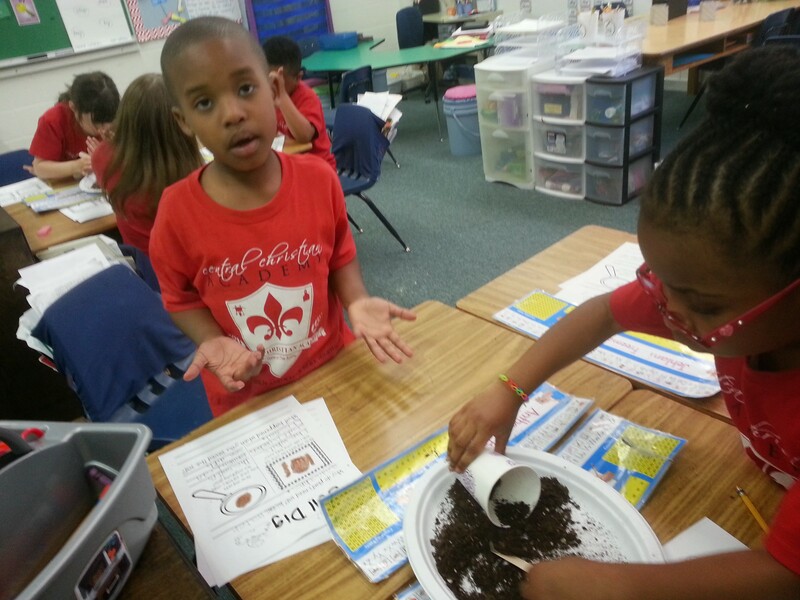 Anthony explains what happens when soil is sieved while Jehlani demonstrates the process. 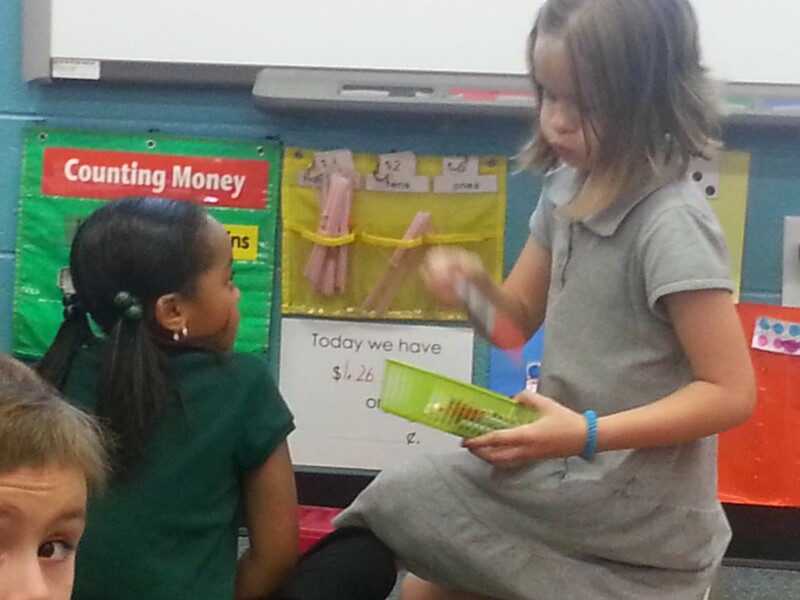 Kayla and Olivia discuss how to write how much money we’ve collected since the beginning of the school year using both a cents symbol as well as dollars and cents notation. The “mouse bouquet” given to me by a sweet firstie! 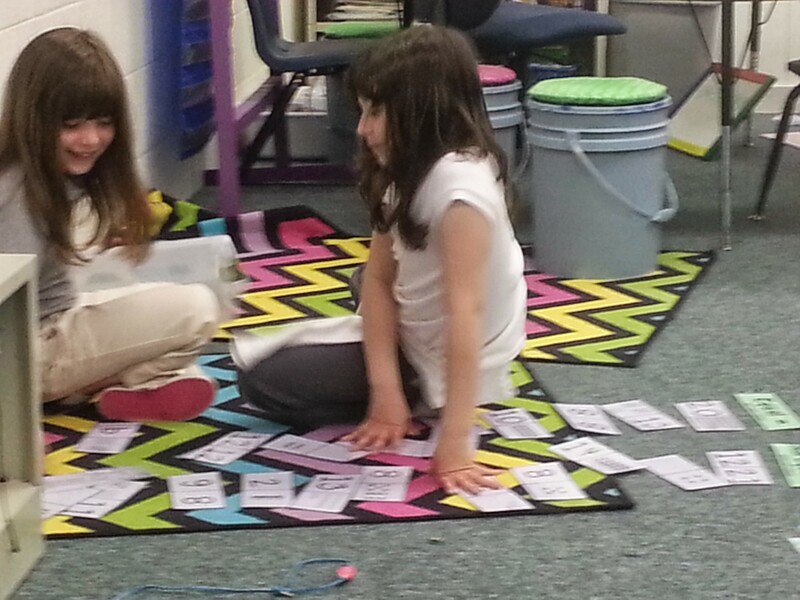 Lena and Kylie organize number cards with different number representations on them. Are they equal or not equal? 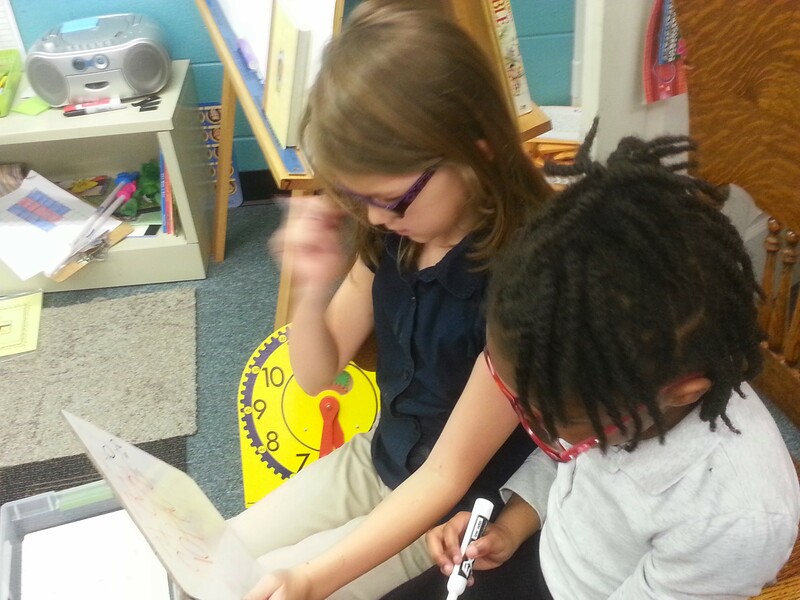 Madilyn and Jehlani use a number card and find the numbers that are one more, one less, ten more, and ten less and record them on a dry-erase board. 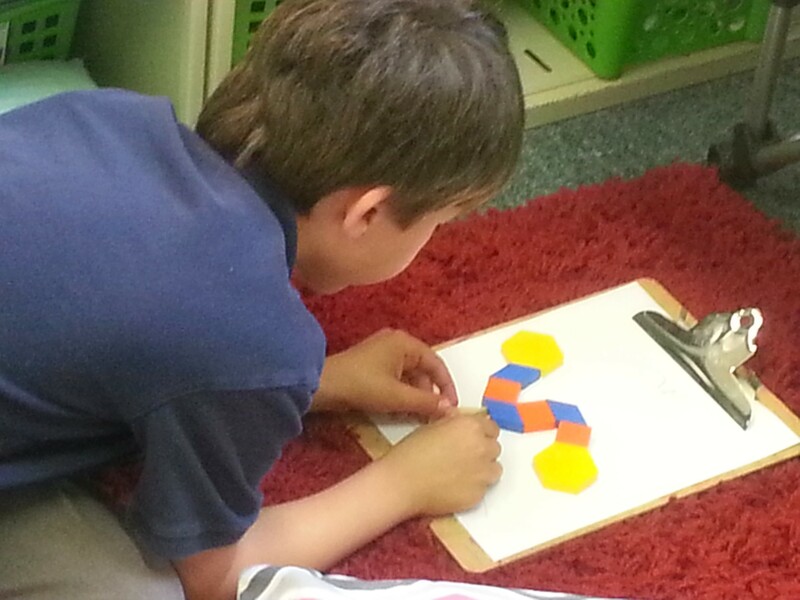 While playing a game to reinforce geometry skills, James creates a shape creature and records it on a piece of paper. Anthony solves a number story problem in his math journal, coming up with at least three different ways to show his answer. 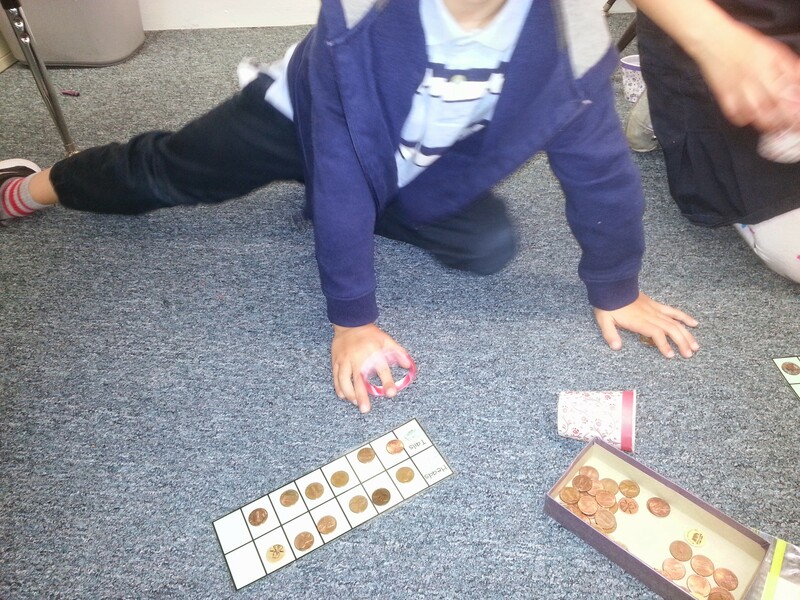 Brennan explains to me why he thinks these pennies were tossed evenly as heads and tails in a probability experiment. 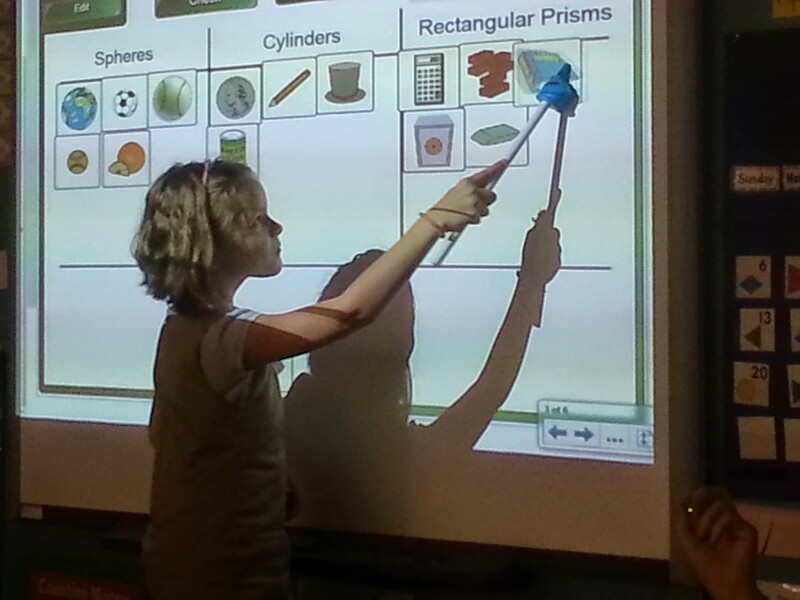 Olivia sorts everyday objects by shape type using the SMARTboard. 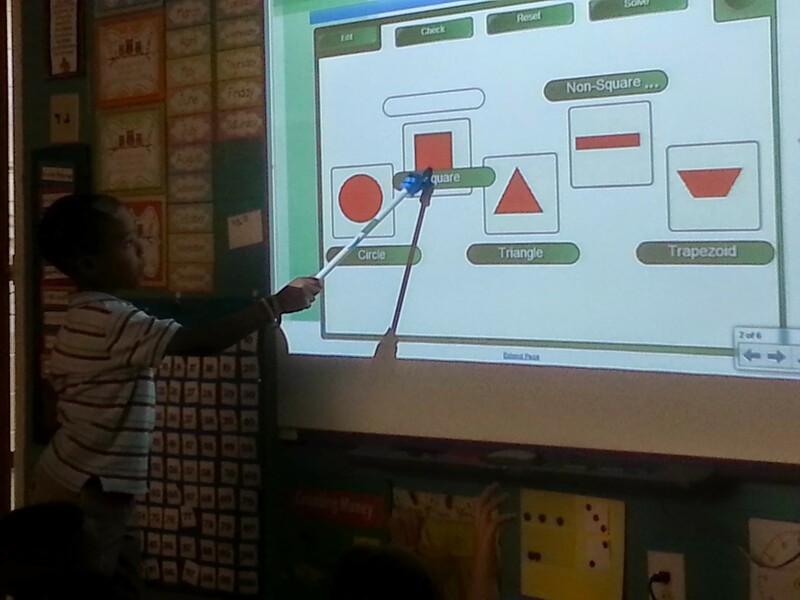 Anthony matches shapes and their geometry names. 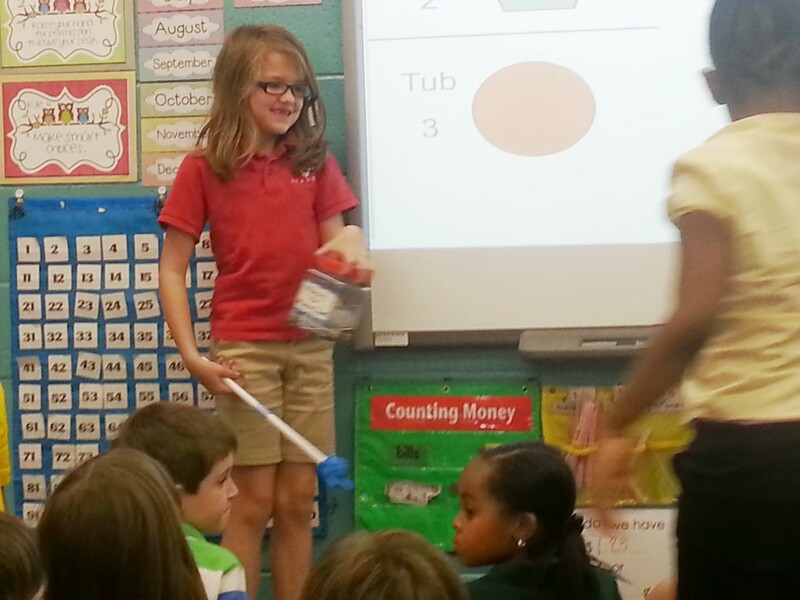 Lena reviews shapes and number concepts with her firstie friends!